Is your pool looking a little dull? Is it time for some pool renovations? We can bring it back to life. From pool resurfacing to tiling and everything in between, our pool renovations specialists can help with any job, big or small. Contact us today for more information or to book an inspection. If your current pool interior is no longer looking its best and discolouration is present then it could be a good time to consider resurfacing. For example – a pool surfaced with quartzon can show signs of wear and tear when it comes off by rubbing, round cracked areas may appear or the quartzon may come off completely. If your pool is covered with marble-sheen then this may be crumbling, discoloured and there may even be evidence of concrete showing underneath. Black algae can begin to grow when these surfaces become worn which also makes balancing the pools ph level difficult. 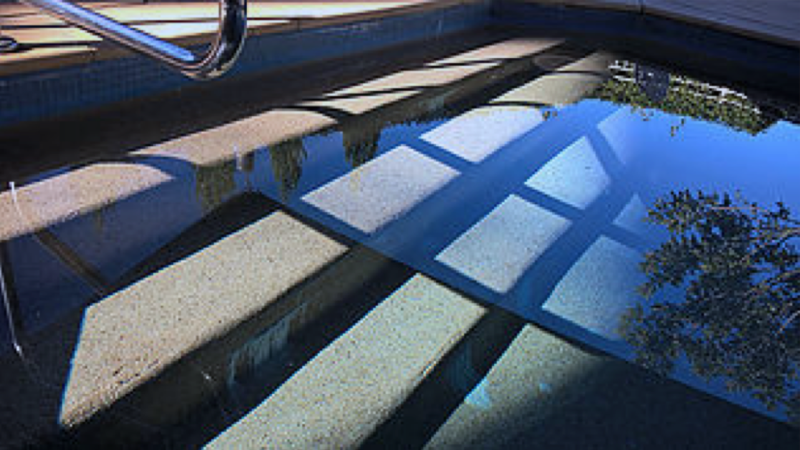 Concrete pools are particularly easy to resurface, and pebblecrete can generally be applied over many different types of surfaces although in some cases the material may need to be removed completely first. Its also a good idea to get rid of swimming pool paint and rust problems since this creates a strong foundation and will deliver a better quality finish to your pool resurface. Pebblecrete consists of a mixture of concrete (thin layer approximately 10 – 15mm) and small pebbles which when exposed become Pebblecrete. De-lamination from the pools concrete surface can occur over time if damaged pebblecrete is left untreated. Cracks can form and leave sharp edges that create a weak point for calcium build up. One of the causes of pebblecrete cracks can be due to incorrect application where the the layer has been applied too thin. Another possibility is that too much concrete has been washed away while exposing the pebblecrete, this leaves the pebblecrete layer with insufficient concrete to bind and build strength between the concrete and pebbles. Repairing pebblecrete is a fine art that needs to be done with precision. The correct ratios of concrete and pebbles need to be applied as well as washing off the correct amount of concrete slurry. Our expert staff would be happy to help with this process so please don’t hesitate to contact us. Ceramic mosaics and glass mosaics are the two most common types of pool tiles used to renovate pools. Ceramic Mosaics are great because they bond really well to the pool surface and a very durable. These pool tiles are cheaper however they are limited in colour choice. Over the last 10 years glass mosaics have become very popular since they have a very large colour range to choose from with many different styles and effects such as crystal, pearl and gold. These tiles really bring a pool to life. Over your pools lifetime it can be a common occurrence for pool tiles to dislodge from your pools surface. Movement from changes in weather can be one cause of this, as the weather cools or warms the pools structure and surrounding areas (including the earth) naturally contract and expand. The Pool Gurus offer a diverse range of pool tiles to suit you budget and desired style. Please get in contact with us to learn more.